Here is the third part of the guide! How to build an Affordable, High Performance and Lightweight folding bike. In the first and second part of this guide, most of the components except the drivetrain components have been shown. This third part of the guide will show the drivetrain components and also the completed bike. Target is to build a 20 speed bike with a weight of <9.3 kg (without pedals) and total cost of < SGD 2000. 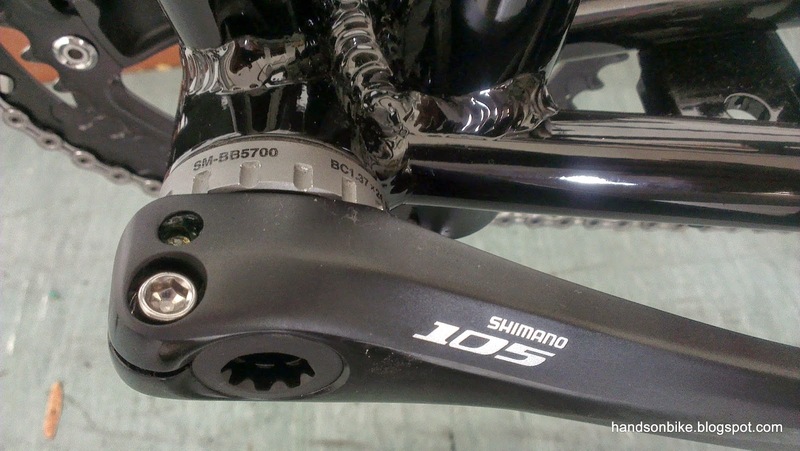 Model: Shimano 105 5700, 10 speed, 53/39T, 170mm, Black. The Shimano 105 crankset is the most value for money crankset you can get. It has many of the top end features such as hollow forged crankarms, effective shifting profiles on the chainring and also good surface finishing. All this at a very affordable price! In this case, the all black colour scheme suits the bike perfectly. Upgrading to an Ultegra 6700 crankset is actually a good idea if you can afford it. The Ultegra crankset will have Hollowglide chainrings for even better shifting performance, and weighs about 80 grams less. Looks quite good too. However the colour scheme does not fit the black MuEX frame, which is why I decided to go with the black coloured 105 groupset for this bike. This will keep the cost down too. Most of the BB of different grades perform quite similarly. Perhaps the higher end ones have better sealing and better surface finishing, but the difference is quite small. The 105 5700 BB is cheap and good, will just use this for now until I find something better. I chose the 105 RD mainly for the black colour. The Ultegra RD will be about 40 grams lighter in weight, but the performance should be quite similar. Once again, I chose the 105 FD because of the black colour. The higher end Ultegra FD seems to be very similar to the 105 FD, not sure what is the difference. This 105 cassette is a pretty standard 11-28T. For me, this level of cassette is good enough. Upgrading to Ultegra or Dura-Ace would save some grams, but at a higher cost. Shifting performance and durability would be quite similar. This is where I went for the best, choosing the top end Dura-Ace 7901 10 speed road chain. This is probably the only Dura-Ace component that is more affordable (besides the BB). The reason for using the Dura-Ace chain is not because it is more lightweight, but solely because it has a tough plated surface that is highly rust resistant. So far I have not seen any Dura-Ace chains rust yet while under my usage. Other chains that are not so well protected will rust rather easily. Definitely worth the slightly high cost. Any pedals will do for a folding bike. For the most compact folding size, of course it is best to get folding pedals, such as the high quality MKS FD-6 folding pedals, or removable pedals. I am happy with these SPD/Platform pedals, as they allow both SPD cleated shoes and normal shoes to be used with no problem. 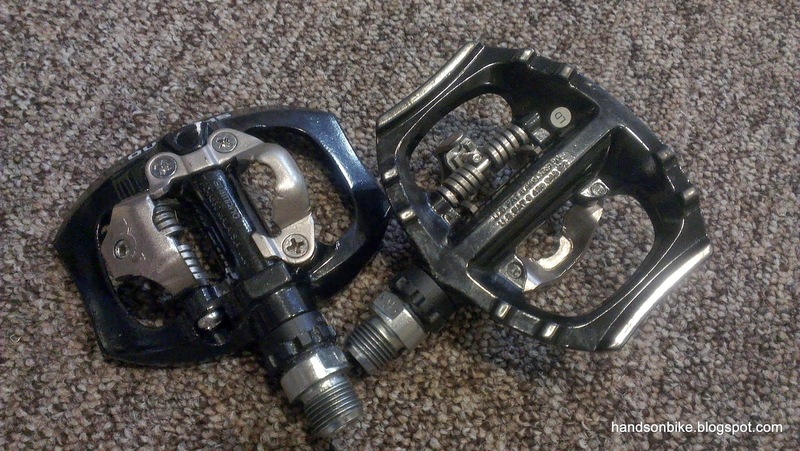 Currently I am also using these pedals on my Dahon Boardwalk and Avanti Inc 3. Note that these pedals are rather heavy, so if you want maximum weight savings then you need to find another pair of lightweight pedals. You could save some weight by not installing the Magnetix, but I feel that it would be more secure if I can clip the bike frame together when folded. 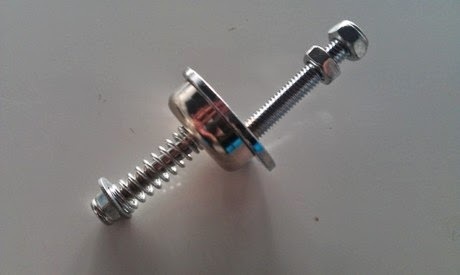 Getting from Taobao is cheap, but you will need special air shipping as it is magnetic. Dahon Magnetix. Fix the magnet to the rear of the frame, and the metal plate on the front fork. 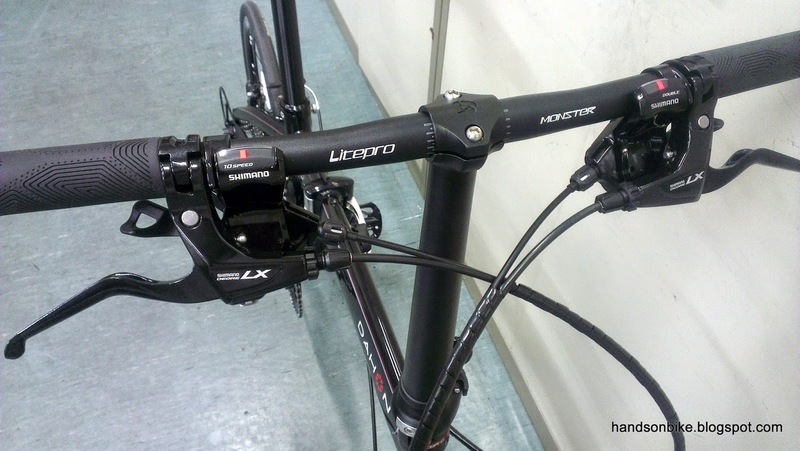 For shifter inner cables, they come with the SL-R780 shifters. Brake inner cables need to be sourced separately. Shifter outer casings come with the SL-R780 shifters too, but it is only long enough for the FD, not long enough for the RD. Need to get the outer casing for RD and brakes separately. Get stainless steel inner cables as they don't rust and thus can last longer. The weight of these parts is an estimate as the actual weight can only be found after all these parts are installed and cut to length. This 200 grams estimate is made from previous experience, during the installation of Ultegra Di2 for the Dahon Boardwalk. Now for some pictures of the complete bike! All the components mounted on the bike! However the bike is not completed yet, it needs some tidying up of the cables and some other small adjustments. The Fnhon 31.5cm Dual Bolt handlepost and LitePro Monster handlebar. Very low profile clamp for a clean look. Shimano SL-R780 10 speed road flat handlebar shifters and Shimano Deore LX 3 finger V brake levers. All in black colour! Front view of the bike. Note the cable routing I used. Instead of bunching all 4 of the cables (2 x shifter cables + 2 x brake cables) together like on stock Dahon / Tern bikes, I decided to split up the cables from the left and right side of the handlebar. This allows smoother cable routing, which improves cable efficiency. I had to measure and check the cable lengths to make sure that there is enough slack during folding. 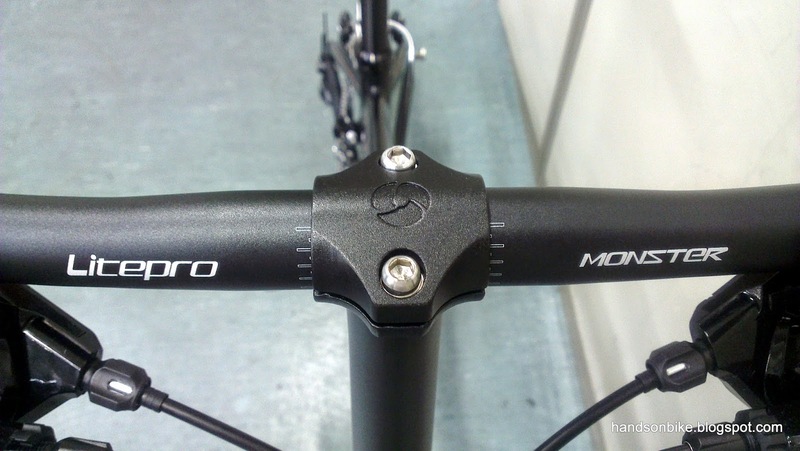 The nice aluminium lever of the shifter, and the open clamp design of the brake levers. Wheelsport Sunny 406 wheels and front brake calipers. Magnetix clip installed. No-nonsense Shimano 105 crankset. With 105 FD and PD-A530 SPD/Platform pedals. I had to use a 1.8mm spacer under the right side BB to push the front chainline out a little, as the chain will rub the FD chainguide when in the largest 4 sprockets at the rear. FD roller for the FD shifter cable. I had to use a cable tie to fix the rear shifter cable housing to the chainstay, so that it does not touch the FD roller. 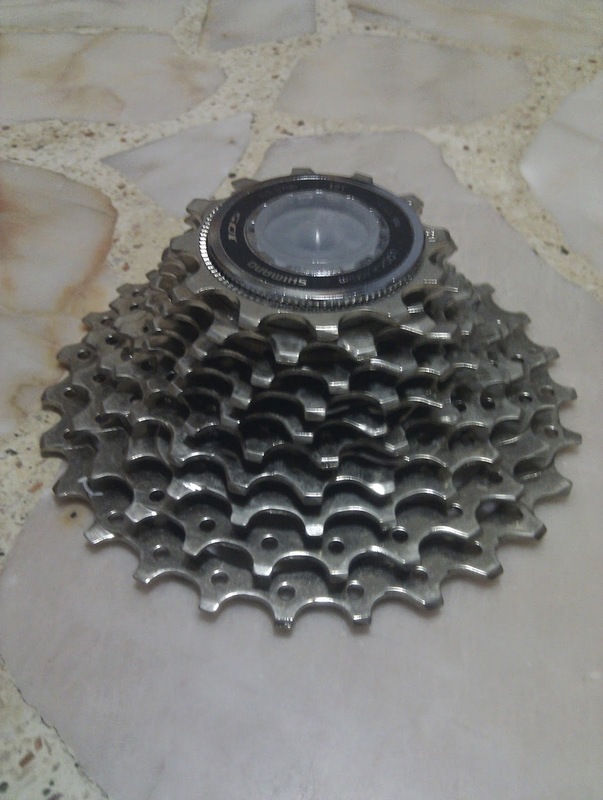 11-28T 105 cassette, with Dura-Ace 7901 chain. Agogo QR skewers. So, did I achieve the target for building an Affordable, High Performance, Lightweight folding bike? I am pleased to say that the target has been achieved! Target price is < SGD 2000. Final total price of all the bike components is just slightly over $1700 as can be seen from the cost table below. This is quite a fair bit below the target price of $2000. What does this mean? It means that if I had spent more to get Ultegra level components instead of 105, I would still be below the target of $2000. By my rough calculations, spending about $130 more will get you Ultegra level crankset, BB, cassette, RD and FD. This would reduce the weight by about 130 grams. At cost to weight ratio of about $1/gram, it is entirely up to you and your budget to see if it is worth it. This would still leave over $100+ in the budget to spend on other components. Changing out the handlebar and seatpost to carbon would use up all of this remaining budget, but with no performance improvements and only slight weight loss. Not worth it in my opinion. My definition of high performance is to have a good quality drivetrain, high quality shifting components, smooth rolling wheelset and tires, and a good braking system. These have all been achieved with my choice of components. Obviously all these components are not top level like SRAM Red or Shimano Dura-Ace, but 105 level of components are already of good quality. Wheelsport Sunny wheels are of good quality at a reasonable cost, while other components such as the shifters, brakes and etc. are also of mid to high end level. Using higher end models will yield slight performance increases and weight loss, but at a significantly higher cost. Target weight is < 9.3kg without pedals. The final weight of this bike, as weighed using a luggage weighing scale, is 9.2kg including pedals (the scale only measures up to 1 decimal place). This is remarkably close to the initial estimated weight of 9.21 kg! If measured without the PD-A530 pedals, the bike would weigh around 8.8kg. This means that the target weight of <9.3kg without pedals has been achieved with a margin of 0.5kg, as the final bike weight without pedals is only 8.8kg. Check out the weight and cost table shown below for the detailed breakdown of the individual component price and weight. Once again, the source stated only refers to the source of the pricing, it does not necessarily reflect the actual place where I bought the components from, as some were bought from other sources, while some were parts bought some time ago. All prices include shipping costs, and are rounded up to the nearest $5. Labour cost of installing all these parts is obviously not included as I installed everything myself. Weight and Cost table showing the breakdown of the individual components used on this bike project. The weight of some components differed quite a bit between the estimated value and the actual value, but somehow the overall positive and negative weight differences cancelled each other out equally, giving an actual weight that is practically the same as the initial estimate. 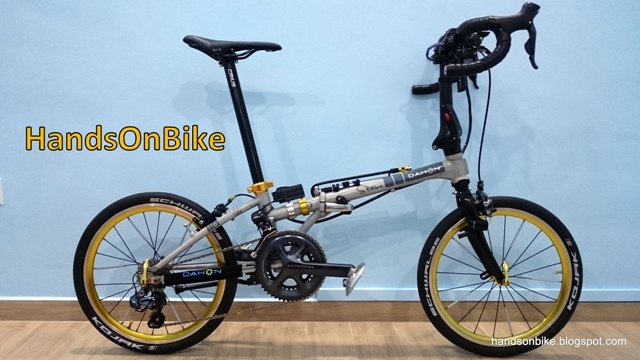 The final product of this project is a 20" high performance 20 speed folding bike with good quality components, with a cost of about $1700 and a weight of 8.8kg without pedals. These are very impressive specs as there is no way you can get a stock bike with these specs at such an affordable price. Consider the newly launched 2014 Tern Verge P20. 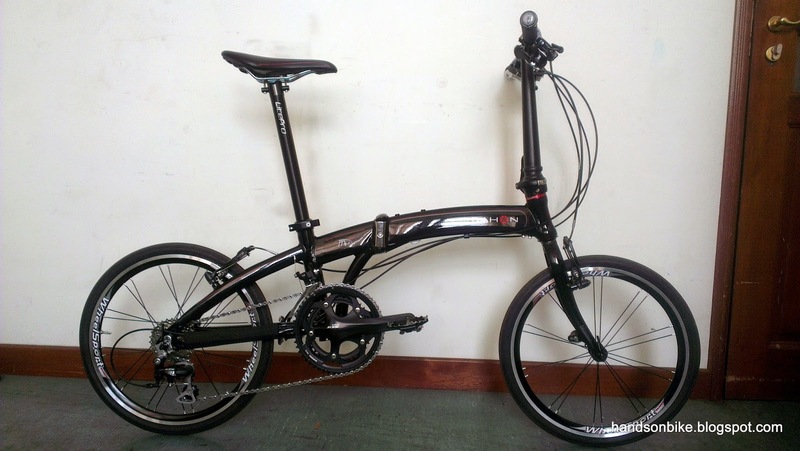 For a similar price of SGD $1700, you also get a 20 speed folding bike. However, almost all of the components are of lower grade, with the exception of perhaps the frame, handlepost, saddle and tires which I deem to be of equal quality. The bike is also quite a lot heavier at 11 kg, compared to my folding bike which weighs 9.2kg including pedals. That said, the Verge P20 is by itself a nice bike that has pretty decent specifications for its price. One of the best platforms for folding bike upgrading. How about the Tern Verge X20? It is the top end folding bike in Tern's range of models, and rightly so. Boasting excellent components and parts all round, it deserves its place at the top. Comparing it to my new folding bike, and you would find that the performance is actually quite similar. Both bikes use good quality drivetrain and shifting components, and good brake components. The Verge X20 might have lighter (but less durable) wheels, but race the same rider on both bikes and the end result would be quite similar. As mentioned earlier, high end components will be lighter and better than components a couple of grades down, but the difference is slight. The difference in performance between SRAM Red and 105 is way smaller than the difference between Ultegra and Tiagra. Note that my new folding bike costs about 2.5 times less than the Verge X20, yet it has probably 90-95% of the quality and yet still weighs 0.5 kg less than the Verge X20 (9.3kg without pedals). Despite using heavier wheels (Wheelsport Sunny vs Kinetix Pro) and heavier drivetrain components (Shimano 105 vs SRAM Red), the final bike weight is still lower than the Verge X20 weight. Putting it in another way, this new bike is almost as good as the Verge X20, but costs $1700 (vs $4200 of Verge X20) and weighs 0.5 kg less. Much cheaper, more lightweight, and almost as good. A pretty good deal! Now, this is not the end of this guide! There is still a Part 4, where other small but important issues that I encountered during the installation will be discussed. Also, there are also some other changes that I will be making to this bike, as I am still not 100% satisfied with it. Will be swapping out some components to improve the ride. Part 4 of this guide is now available! Click here to continue. It might be possible to get some stuff cheaper in Malaysia. But online prices are also quite low, so the difference will not be great. Hi Steve, Great write-up and very informative. 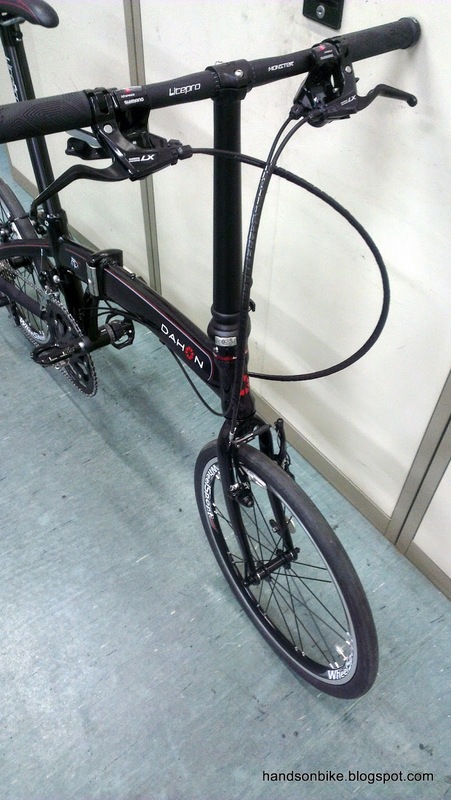 I notice that the Dahon MU Ex frame you have used in this project looks like the Dahon Vector/Tern Verge frame. This is different from the current Mu frame, very nice. I like the Vector/Verge frame design. Am planning to get the Tern Verge P9 to upgrade to better components, what do you advice ? 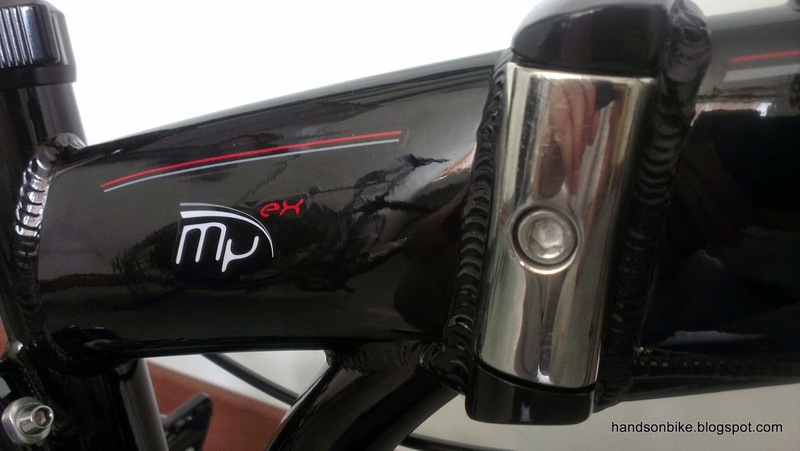 The main difference between this frame and the standard Mu frame is that this Mu Ex frame has a chain stay for improved stiffness. The Verge P9 is a good frame for upgrading. Ensure that it has a FD hanger, and you are good to go for any upgrade. 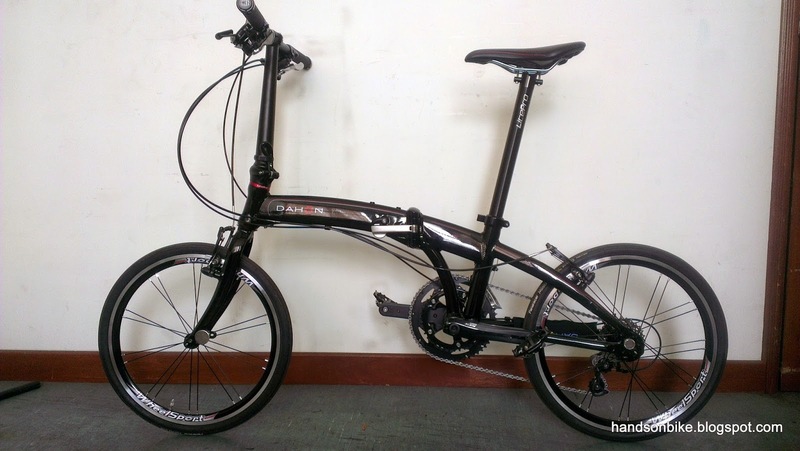 Hi Steve, Found a Dahon Vigor P9 in Malaysia...looks pretty much like a Vector/Verge frame. However need both FD & RD hanger to accommodate the Shimano road FD & RD. Do you think this is a good bike to upgrade ? I would recommend getting a frame that already has the standard RD and FD hanger. The alignment is usually better, and you don't need to source for the hangers separately. Yes I think this will work fine. The frame will need to be opened up a little wider but there should not be a problem. You will also need to get the compatible shifter and the click box for the internal hub. Steve, congratz!!! Very inspiring project!! Im currently building my 1year old tern link p9. Im between a sram force crankset and a shimano 105 crackset. But after reading your post I have decided that shimano 105 is good enough. Are you able to advise if my tern is able to fit the Shimano 105 5700, 68mm English Thread bb? 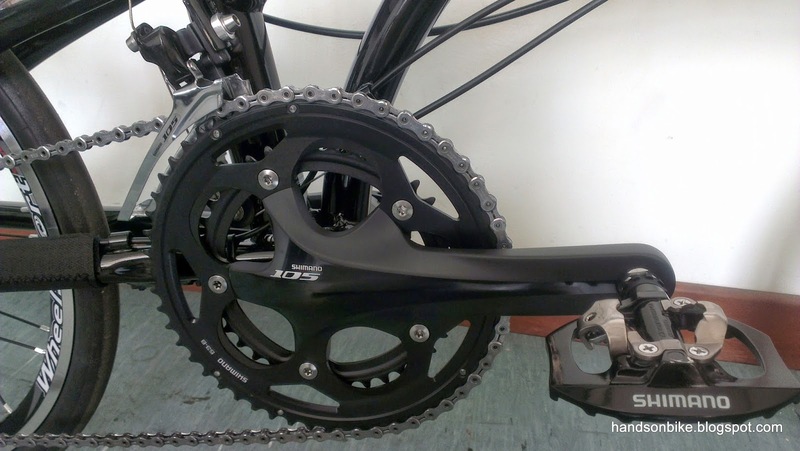 Say if I were to follow your shimano 105 5700 crankset setup, will there be any issues? No problem. Dahon and Tern frames are all 95% similar in terms of compatibility and specs. Main difference is appearance of the frame. Hi Steve, in your opinion, tern c7 good for upgrading or better off buying P9? Definitely better off buying P9. All the components are of better grade, and the ride is also better. Just try it and you will know the difference. Even for upgrading, the Verge P9 frame is much easier as it already has a standard RD hanger and FD hanger for mounting standard RD/FD. Thanks! I thought C7 also has the standard RD hanger? Ah yes the C7 also has the standard RD hanger. In this case the main difference is the FD hanger. Another difference is the headset design of the frame. The Verge frames can use the better one piece handlepost which is much stiffer than the one on the C7. Thanks Steve for the info. will try with upgrading C7 as i have no intention to use the FD. May I know what are the alternatives for BB and crankset? 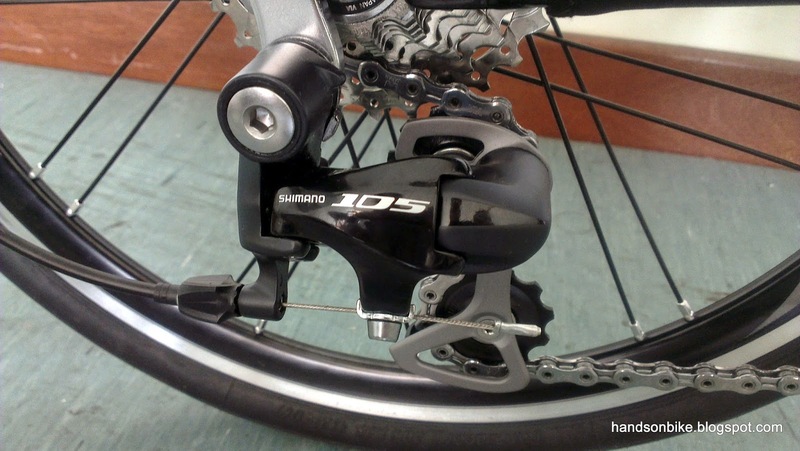 Is driveline more value for money compared to shimano 105? Driveline is an alternative brand from Taiwan, not too bad. But for quality wise and value for money, 105 is still better. Hi, can the parts that you've mentioned especially crankset like tiagra or 105 can also be fitted in Raleigh's MV8? No problem for Raleigh MV8. It uses standard BB threading, so you can install the Hollowtech II BB and crankset. Any road crankset will work fine. I'm quite sure the OLD is 100/130mm. Square taper is the type of BB, you can change it out to other types. The crank and BB must match, of course, so when you change from the square taper crankset to Hollowtech II crankset, you will also need to change the BB from square taper type to Hollowtech II type. The mounting on the frame is the same, so you can change the crankset and BB on the Vitesse frame to Hollowtech II type. Hope this clears up your doubts. Hi, i would like to check if Shimano 5700 105 Bottom Bracket is compatible with Shimano 105 5750 Compact 10sp Chainset? The stock bike comes with a clamp on MTB FD, so you need to use back the clamp on type of FD, as the frame does not have a FD hanger for a braze on type FD. As for diameter, you need to measure the external diameter of the seat tube to know the clamp size required. Hi there again, is there a good compatible crankset single speed only that matches the stock? Torn between the same 8 SPD or upgrade to -10spd cranks. Just get the 10 speed crankset, it can be used for 1x8 or 1x10 speeds. 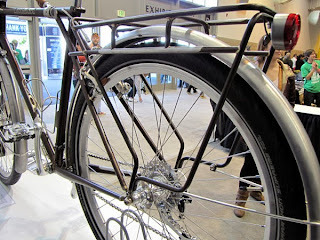 Do get a bashguard or the Tern Mainstay chainguard to prevent chaindrop. hi again, just want to your professional advice, is tektro r540 compatible if im building a 20" wheelset mini velo. Also, any recommendation for speed chain if i'm using Shimano Ultegra 6750 Compact 10sp Chainset and Shimano 105 5700 10 Speed Road Cassette. The compatibility of the caliper brake depends on the reach required, which is the distance from the brake mounting point on the fork to the braking surface on the rim. For most Dahon bikes, this reach is quite long, as there is more space between the tire and the fork to allow for mounting of fenders. Thus I used the extra long reach Tektro R559 on both my Dahon bikes. I would suggest measuring the distance after you install the wheels onto the frame and fork, then buy the brakes. Note that if you can fit a 451 wheelset, then you might be able to use standard short reach caliper brakes. For the Shimano 10 speed setup, any 10 speed road chain will do. 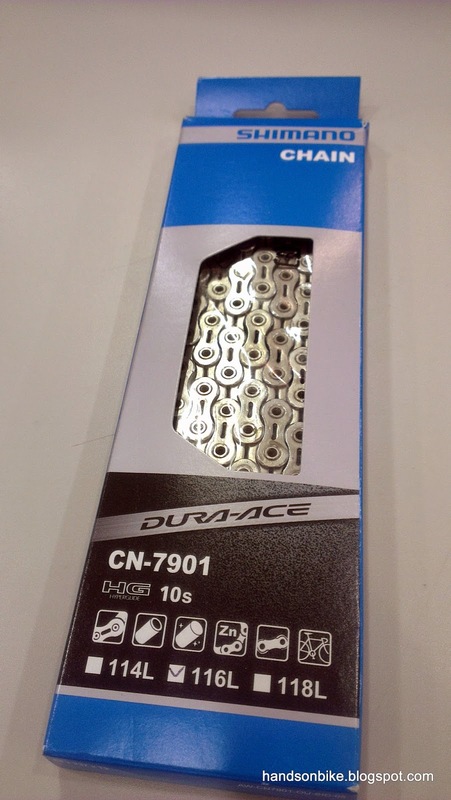 I personally recommend the Dura-Ace 7901 10 speed road chain, as it is very rust resistant, and works best with Shimano components. Besides, it is more affordable (SGD 40 on CRC) compared to other similarly high-end chains. Hi, can i check where did you get the front derailleur roller? These wheels seem to be of quite decent quality, from what I can see in the pictures. They should fit your Mu SL. I want to upgrade my eco3 using Shimano Zee RD + Shifter + 11-36T Shimano XT Cassette. I'll use single 52T crank. Is it possible for Zee to use 11-36T cassette, because some people said that it only supported 11-32T. 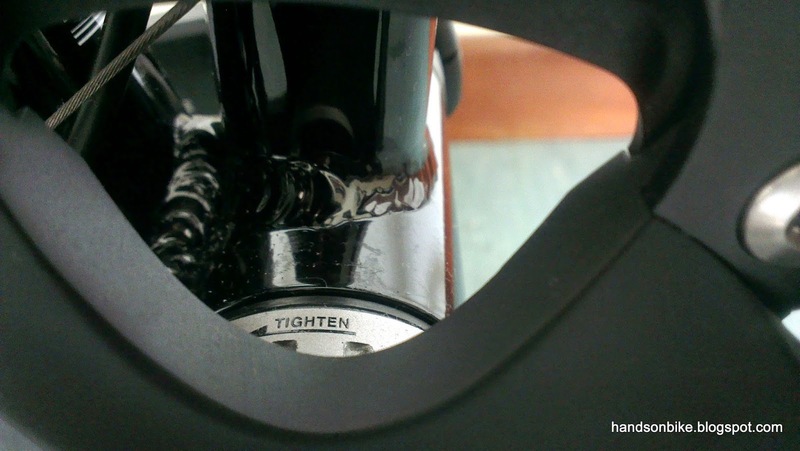 The Shimano Zee RD cannot support up to 36T. You can find the info on the internet. In any case, I'm not sure if your current Eco 3 wheelset can support a cassette. You might need to change the wheelset to one that supports 8/9/10 speeds. Ooo, I have new wheelset too for Eco3. So, if I want to use 11-36T like Vector x10, what RD should I use? Zee supports up to 11-36T. What do you think? You will notice that there are 2 models of Zee, one for 32-36T and the other for 23-28T. It seems that you are right, the Zee can be used up to 36T if you choose the 32-36T spec. Note that it can be used up to 36T only if you have a single front chainring. If you are using double or triple front chainring, the Zee RD cage will not be long enough to support up to 36T cassette. So yes, you could use the Zee RD for a 11-36T cassette on your bike, with a single front chainring. Now I confuse there is no information what to differentiate them. Here in my country, bike shop only know 1 type of Zee, they are not sure which one it is. I only use single front chainring, any suggestion beside Zee? XT Short or Medium may be? A MTB RD will work for 36T. However, the cage will be quite long which is not ideal for small wheel bikes. Get the shortest cage RD you can find that works up to 36T. Local bike shop here suggest any shimano medium cage RD will work for 20" folding. Do you think so? Or had better to go with short one? Since you are using only front single chainring, either short or medium cage will work. As long as the RD is designed for 36T it will suit your purpose. The difference between short/medium/long RD cage is the chain capacity. If you have a double or triple front chainring, the extra chain capacity of the medium/long RD is required to take up the chain slack when in the smaller chainrings. If you have a single chainring, a short cage RD is sufficient to take up the chain length difference between the top and low sprocket of the cassette. I was wondering if i decide to use 451 wheels on the Dahon muex, Would the the shimano 105 brake caliper work or do i need to do some mods? I can't say for sure that it fits, but there is a high chance it will go on without any problem. Let me know if it still doesn't fit. Hi Steve, nice job. Will you consider selling your bike or building a similar one for a fee....8)? I would like to know that u get some part at ChainReactionCycles (CRC). so is the ChainReactionCycles (CRC) online website or ChainReaction shop in singapore? Hi There, u got a very informative blog. Would u be able to provide the link where you got the frame from in Taobao? I'm not a chinese so if you provide the link it would be really helpful to get the original Dahon frame. Hi Steve, thank you for sharing this post. It is very informative. I am planning to get the ultegra 6700 crankset for my x10 from chainreactioncycle but I am unable to find the bb "bb-sm6700'. Could you recommend one? Also, I have been looking for the gear shifter you have recommended, SL-R780, but could not find it. Can you send me the link? I think the current 6700 bb has been discontinued. You can get the Sm bbr60. As for sl r780, it is not available on crc. You need to get from bike-discount.com. Do you mind posting a link to the Magnetix on Taobao please? Hi Steve, what crankset would you recommend for 451 dahon speed falco if I wanna still have single front setup? I'm thinking of having 105 Rear derailleur. The Ultegra 6700 or 105 5700 will work fine. Just remove the inner chainring and install the Tern Main Stay Chain Guide. 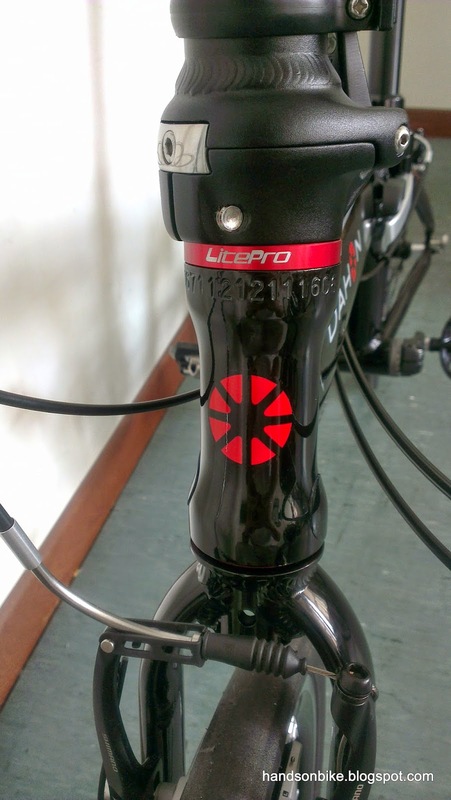 What about litepro crankset? How are they compared to shimano? I have not used the Litepro crankset before and so I am not sure of the compatibility or quality. Hi what did you use to tape the cable housing? It is just cable wrap, such as those used to wrap around electrical cables to bundle them together. Hi, can I check with you where can I buy spacers for the crankset? My 105 is rubbing with my bike side stand. how did you determine what thickness is suitable? Well, it is only possible to put about a maximum of 2mm. Any more, and you will not be able to fix on the left crankarm properly. Hi there Steve. Seeing your bike specailly the weight of 9.2kg sparks my interest. What are the specs of your bike? You can do a component by component comparison to see the difference. My bike is almost the same specs as yours except some lighter parts. Schwalbe durano tires. Not sure about the weight. As earlier stated no fd and front shifter, removed the 105 small chainring. Kinda weird huh. I have'nt checked all the parts weight except the ones mentioned. Crankset also same? My actual measured weight and calculated weight are almost the same, so the component weights are quite accurate. If you can link to a picture of your bike, I can see if I can spot anything. Yes i have the same 105 5700 crank. Changed to single chainring. I guess the problem lies in the frame itself since i dont know the actual weight of it. The 2.5kg is from someone else with the same frame. So i dont know for sure.i'll weigh it myself nextime i do a full overhaul. I hope this weight mystery will reveal itself. Thanks for the reply and ride safe always! Hmm what frame is it? Also, don't forget the weight of the front fork. Hi. Steve. Thanks for your response in a separate post. I would be most grateful if you could shed some over views on the dahon bottom bracket and suitable crankset for it. I am a bit confused by it all. I have a mu ex carribean blue and would like to upgrade the crankset to FSA SLK light carbon ones. Just wondering if I can find the compatible bottom bracket to pair up the frame and the crankset. I also have an speed pro chromoly frame. Can its frame accommodate the variety of modern bb standards available today so I can upgrade to the latest SRAM/shimano 22 speed groupset (or the FSA SLK light cranks)? I think both the frames have a standard English threaded 68mm BB. In this case, you can change to Hollowtech II type BB, with a 24mm diameter spindle. 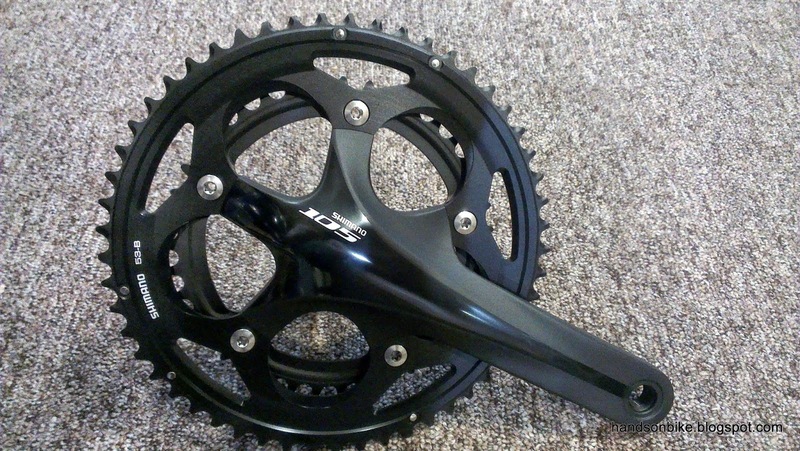 FSA cranksets come in different spindle sizes, so you have to get the compatible type. Those oversized types such as BB30 will not fit. With a Hollowtech II type BB does that mean I can fit the latest standard shimano 105/ultegra crank sets? What about for SRAM crankset? Yes with Hollowtech 2 bb you can fit the latest Shimano cranksets. For SRAM cranksets you will need a different bb. It may also fit the frame depending on which type of Sram bb and crankset you choose. Thanks. Steve. In the process of upgrading mu ex carribean blue. Found a used sram red crankset to go with it. Now running into issues with adding front derailer and running its cable. I intend to fit a SRAM Yaw FD. Cable routing is the issue. 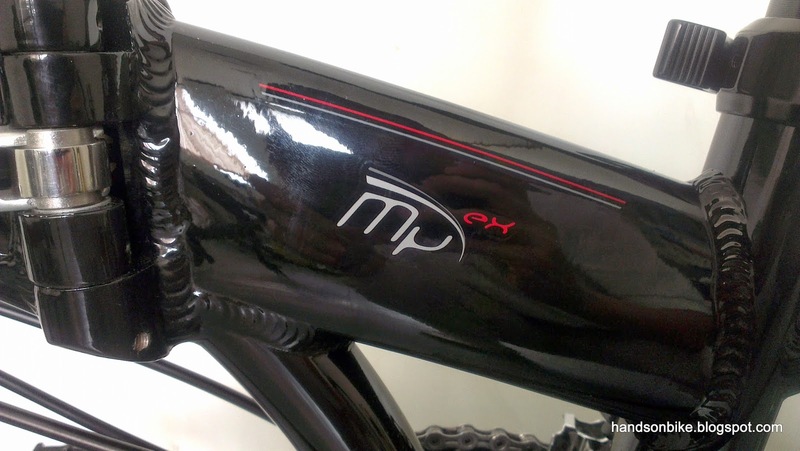 This newer mu ex frame is different from yours with internal cabling and without chain stay. I intend to run the cable for the FD as your mu ex. I will use a FD hanger lite pro and a cable housing thingy as shown on your frame http://2.bp.blogspot.com/-kLHYy7mqn4I/UzQduRsltrI/AAAAAAAAHe4/WGEQA3PY7uY/s1600/IMAG2013.jpg. I am missing the cable redirection wheel that would redirect the cable from low to high so it can be fixed (http://2.bp.blogspot.com/-kLHYy7mqn4I/UzQduRsltrI/AAAAAAAAHe4/WGEQA3PY7uY/s1600/IMAG2013.jpgd) to pull the FD. Would you kindly shed some light on where I can find such item and any other issues I may encounter in the process of upgrading to 20 speed? Thank you. If you are using the Litepro fd adapter, you don't need the roller wheel for the fd cable. The outer casing for the fd cabling will run to the stopper on the fd adaptor. You can check out the fd routing that I used on the Boardwalk and the Vitesse, which runs the fd outer casing under the bb. Hi Steve, I got "poisoned" by your blog and now I'm slowing collecting parts to build a new bike as well. I got the Shimano FD-5700 and I'm thinking of getting the Shimano FC-5800. Would like to ask if you have any idea whether they would be compatible? Thanks. If you are using for 10 speed system with 10 speed chain, it should be OK. The chicken wing effect refers to the rd cage overstretching if the rd cage capacity is not sufficient. If your chainrings are of similar size, and you are using the same rd, there is no problem. However, shifting will be a problem. As a rule of thumb, shifters must match rd and fd. 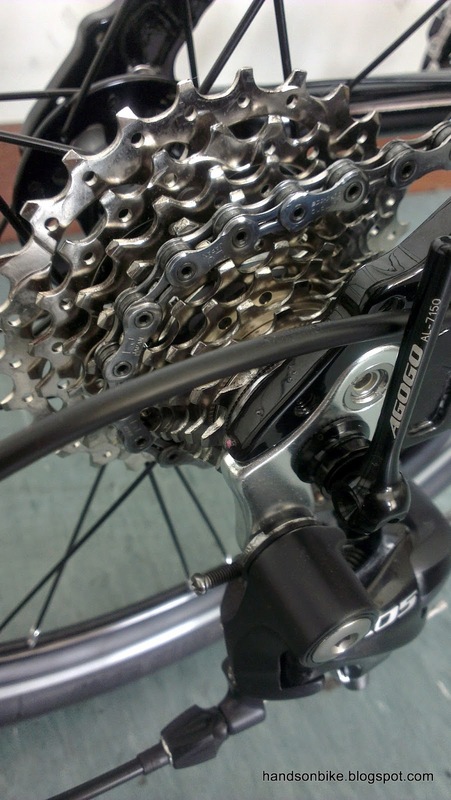 Chain must match cassette and fd in terms of speed. Crankset must match fd in terms of speed. In your case, using 8 speed chain will cause problems with front shifting, while using 10 speed chain will cause problems with rear shifting. You can use front single crankset, or change crankset to Claris road 8 speed. Else change the whole drivetrain to 10 speed if you want to use the 10 speed Ultegra crankset. You need the road braze on type, not the clamp type. Hi steve, this blog is seriously poison !!! i had reading ur blog for days and finally decide to make a post here. i am currently in the mid of deciding which foldie to get. 24" or 20" ... tern verge p9 or eclipse p18 ... dahon vigor d9 or ios d9. Most people get 20 inch folding bikes as they fold more compactly, and there are more wheelset choices available. The Tern Verge P9 is a good choice. Thanks mate. Just did a round survey here no more VergeP9 unless wait for next stock which will be expensive due to currency in malaysia. Do you think Vigor P9 can get the same result/weight with Verge P9 after mod ? IF still verge better then i might consider order and wait. They are probably similar, so go with the frame design amd colour that you like. BCD stands for Bolt Circle Diameter, which is the diameter of the circle that passes through all the chainring bolts. 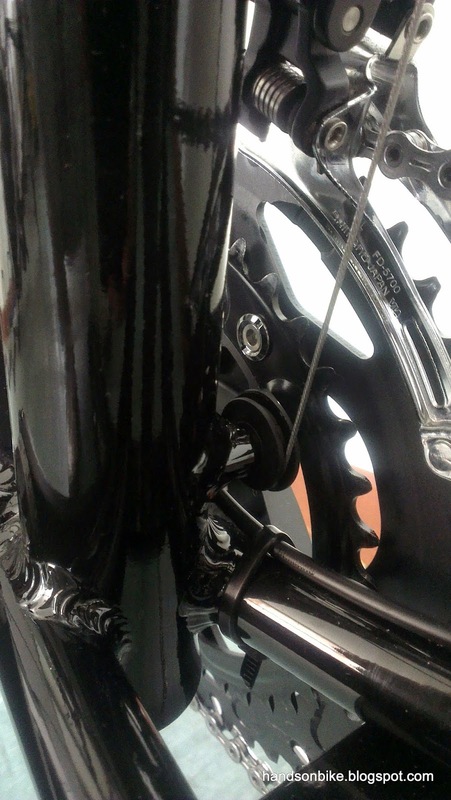 In order to fit the chainring to the crankarm, the BCD must match, in terms of diameter and also the arm angle. The 11 Speed Ultegra 6800 crankarm has a 110mm BCD and with asymmetric arm angles, and so you cannot fit other chainrings on it unless it has the same design (mostly from Shimano). My Dahon MU EX frame finally arrived and I've gotten the 11-sp 6800 components so far, except for the Front D because I wasn't too sure which one to get. Would it be possible for the 5700/6800 10-sp series Front D to work with the 11-sp system? Thanks! I think the frame still can accommodate the 6800 fd, just that there will be little clearance between the fd arm and the seatstays. 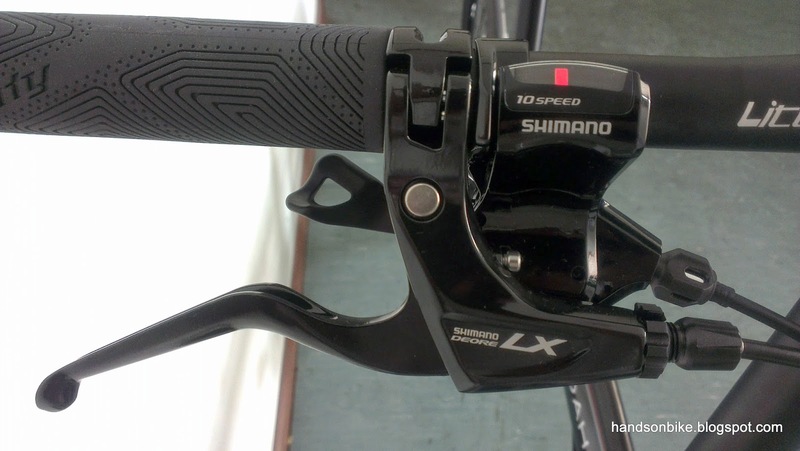 The 10 speed fd will not work with the 11 shifters. Hi Steve, had a word with my mechanic who said that he managed to install the 10 speed FD with 11-speed shifter before...just have to bring the FD for him to install... hope he knows what he's doing! Can install, but will not work well. You won't get light shifting or accurate shifting. Let me know how it goes. Hi, my mechanic from L&T managed to install the Shimano 5700 front mech and got it to work with the Dura-ace 11-sp bar end shifters! No problem with shifting...now I need a bit of practice to get used to the bar end shifters. Good to hear that. Just curious, is the left bar end shifter indexed? or is it friction type. Hi Steve, it is a fantastic project assembling your own bike. Your post is very informative and inspired me to build my own folding bike like you did instead of getting one from the market. Is the below link is where you get your MuEx frame from? Do you think that this project is too difficult for a newbie like me(haven't ridden a bike in years)? I think I got it from here instead. Have you built up a bike yourself before? You will need some specialised tools and technical ability to build it up yourself. I haven't build any bike by myself before nor do I have the specialised tools, however I really like the idea that I can choose every single part and build a bike that I want. Do you think it's possible that I can find a bike shop and have them assemble the bike for me? And how much will they charge for this kind of service in singapore? Thanks! I haven't used the other link so I am not sure. 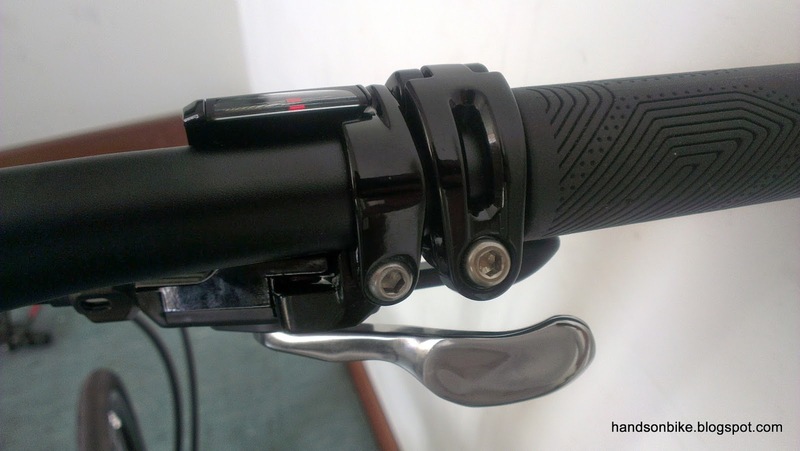 If you compare the two, 1120 RMB vs 1550 RMB, the difference is that the more expensive one comes with a Fnhon handlepost. Not sure which bike shop can do that, you might need to ask around. But I can tell you that bike shops that sell Dahon brand of bikes will probably not do the job for you. Full bike assembly will cost at least SGD 100? Hi Steve, thank you for your kind advice, now I know which link should I use. Yes, you are right, did a quick google search and found that some shops are offering such service at around SGD 100, which still a pretty decent deal as I do not need to invest in the specialised tools, avoid bike assembly mistake, and save the tuning cost. Will have more questions coming seeking your advises on parts selection and hope you don't mind. Once again, thank you. Thank you so much for putting all these useful info together! I'm so inspired to upgrade my Java Fit 16SD folding bike! Will like to check if upgrading my current crankset and BB to 105 5700 10 speed double chain and ultegra 6800 BB is compatible to my current 2x8 speed setup? Will it cause the shift transition to be of issue? 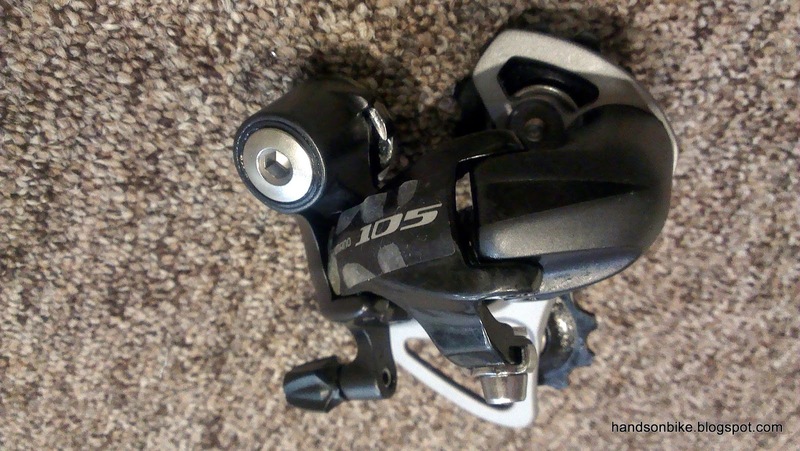 Or need to change out RD,FD,cassette and shifters to 105 5700 10 speed setup components as well? Suggest changing all to 10 speed components. Else there is no point, as performance will be poor due to incompatible components. Would you recommend to build a totally brand new 105 5700 10 speed drive train with Dahon MU EX frame altogether instead or do the 10speed components upgrade to my Java Fit currently? I'm pretty comfortable with the existing frame actually but not sure if the existing wheelset will hinder my future upgrades. It depends on what frame you like. You should be able to upgrade nearly everything with either frame. 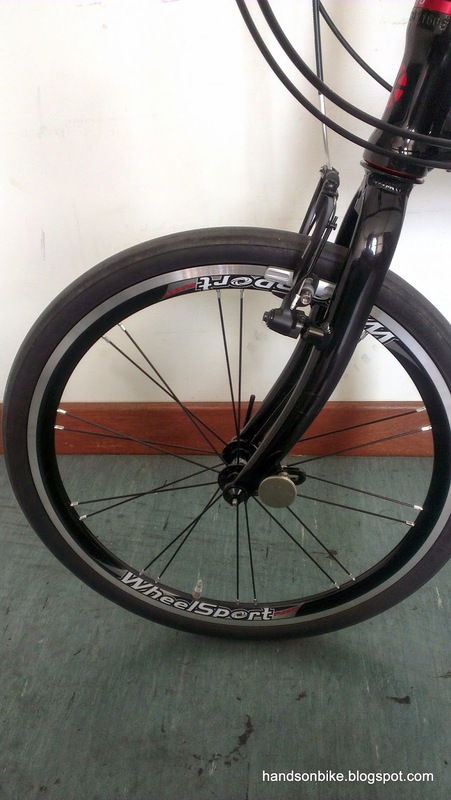 Any idea if Wheelsport Sunny wheelset is suitable with Java folding bike frame (TT Pro/Fit)? I'm thinking of upgrading current 451 wheelset to Wheelsport Sunny 406 for more comfort and lighter ride. But not sure if wheelset is compatible with existing disc brake system. Does this means that hub needs to have compatible rotor mount? My current hub size should be 100/135mm but see that wheelsport wheelset only has 74/130mm. 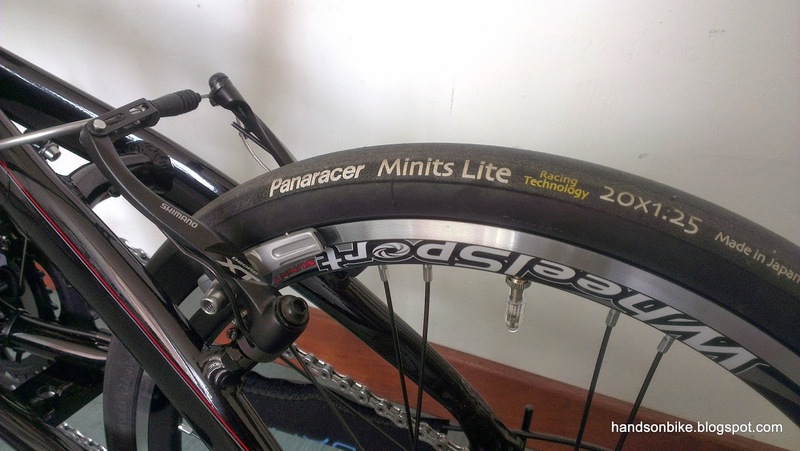 So 100/135mm adapter is required if to use Wheelsports wheelset? Try the Wheelsport Smart Disc Pro which is for disc brake mounting. It should be 100/135mm OLD. Can check it out at MyBikeShop. For the Tern Link B7, it is not really suitable for upgrading, as you will also need to upgrade the wheelset to accommodate a 10 speed cassette. After that, you will need a 10 speed road crankset, chain, cassette, rear derailleur, front derailleur and shifters. Depending on the grade of components you choose the price can differ greatly. If you still want to upgrade the Tern Link B7, you can refer to the upgrading articles of my Dahon Boardwalk, which was also upgraded from a 7 speed drivetrain. A more cost effective way is to sell the Tern Link B7, and get a Tern Verge P20. It is much easier and also cheaper than if you upgrade your Link B7. I have the same case here. I found cheap drivetrains but they are MTBs. The challenge is that I am not familiar on what will happen if I will force an MTB hub that has 135mm O.L.D. (over locknut distance) to Tern Link B7 that has 130mm O.L.D. Hi Steve, I am intending to install a pair of brake 4700 caliper brakes on this same frame with 451 wheelset. 1) Do you think the Elosix rear caliper brake adaptor will work on the 451 setup? If you are using 451 wheelset, I suggest not to get any adaptors first. The road brake calipers might fit nicely without using any adaptors. Thanks Steve! Have managed to fit in the 4700 front brakes in today, with the 451 wheelset. No adaptor is required. However, I have to do some filing at the front and rear bolt holes of the frame to make it larger to accomodate the bolts. From what I see, the best way to fit the rear brake is to install it bolted upside down, and insert some concave washer to create space for the brake so that it does not hit the underneath of the seat stay. (That looks like the only to do it, w/o the need for any adaptor). What do you advise? Any other suggestion to fit it? Yes that sounds like the best way to install the rear brake calipers. hi, i have Dahon Mu D8, is possible to upgrade as this. You can follow most of the steps except the front derailleur, as there is very little space on the MuP8 frame to install the fd properly. Hi, I have a Tern Verge N8 and would it be possible to add a Shimano 105 crankset, FD and a Shimano SL-R780 left 2 speed shifter? Thanks. You need to use the 2x8 speed components. Since the bike is using 8 speed chain, the FD and crankset needs to be 8 speed compatible, which means using the Claris FD and crankset. 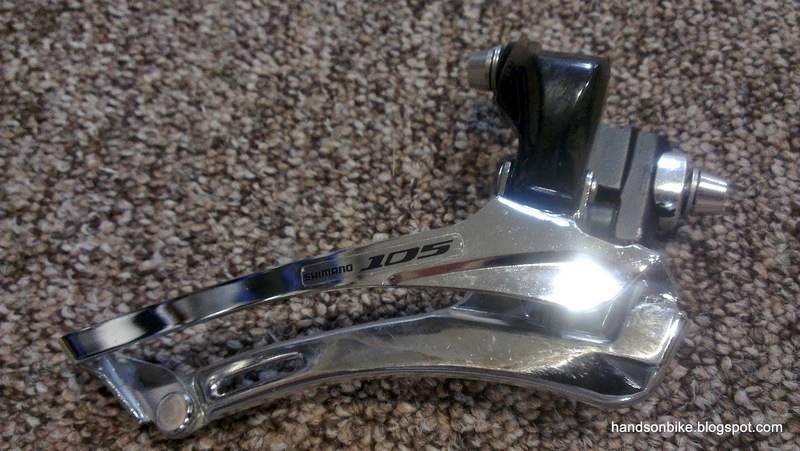 The shifter also needs to be from Claris, which is the Claris front double shifter. If you use the 105 crankset, it will have lots of rubbing noise between the 8 speed chain and 10 speed crankset. If you use SL-R780, you will need a 10 speed road front double FD. This will cause rubbing issue with the 8 speed chain. Thanks Steve. Its meant to be a long term plan for me hence was thinking if I could change the 105 crankset, add a FD and a double left flat bar shifter it would work until i get to change the 105 10 speed cassette, 10 speed chain and RD. In this case I've read that 10 speed Tiagra shifters would work with the 10 speed 105s. Can I just use the left double shifter from the Tiagra first and then change the right shifter when i eventually change the cassette, RD and chain? Or i guess it would be better if i do this all in a go then? Thanks for the advise. Ad already explained above, there are many components and they need to be compatible to work properly. Just change the whole set at one go. And note that Tiagra 4600 and 4700 are not cross compatible. Ic got it, in that case since the Shimano 105 groupset doesn't come with flatbar shifters, guess i can't use the 105s then :(. Thanks anyway for your advice. You can show your list of components that you want, I will take a look and let you know what is compatible and recommended. Best to change everything at one go. Your list of parts for 10 speed is OK.
As for your second option, it will not work. Although your shifter and FD are 10 speed, the chain is still 8 speed, which is wider and will rub a lot on the FD chain guide. Got it! Thanks for the advise! Hello Steve, thanks for writing these advices. I own a Bickerton Junction 1507 (7 speeds) and need to update the single crankset since I live in an area with many hills. I appreciate your advice about a new one either with 42t or 36t. It will be better to change to a front double crankset, and get 2x10 speeds. That will give you the gear range for hilly terrain. Thanks again. I did some research but couldn't find the left grip. In case I can't get it, what is the recommended single crankset? In other words, is it a good idea to try with another plate with fewer teeth? The crankset that you have probably has a fixed front chain ring, which means that you can't change just the chain ring. You will need to change the whole crankset. The bike that you have is not ideal for upgrade or modifications. Might be a better idea to get another bike, such as the Tern Verge P18 to get lower gears. No shop carries all these components. I have already listed out the source of the parts above, you should be able to get most of it online from CRC and Taobao. hi can the wheelsport sunny be paired with tiagra cassette 11-32T. will the RD Touch the spokes?